Congrats to Samantha Cortese and Chris Di Vincenzo on their recent engagement! I was absolutely thrilled to photograph their Attraction Session in Tucson, AZ! You may recognize these two…Sam anchors KGUN9‘s Good Morning Tucson and Chris is a producer for ABC7 as well as a former Oregon Duck football player! 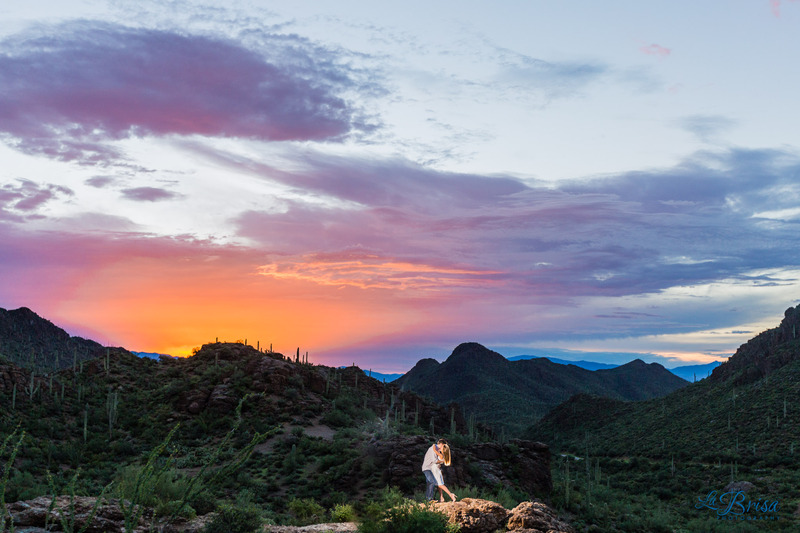 After another wave of #monsoon2017 storms ripped through #Tucson, I wasn’t sure if my sunrise engagement session with Sam and Chris would still happen. At 4am, Sam texted me and asked if we needed to cancel due to weather. I replied that I was game if they were. She immediately responded that they wanted to give it a try and I instantly knew that it was going to be an awesome shoot because they would be up for anything! Thankfully, we went ahead as planned because we were blessed with an absolute gorgeous Arizona sunrise! Thanks to the departing storm, the temperature stayed cool and we were able to walk around without sweating through our clothes! We ventured all around the Gates Pass overlook and then headed over to Presta Coffee Roasters in Mercado San Agustin. When Sam and Chris first started dating, they went on countless coffee dates. Due to working at late night/early morning newscasts, coffee was always open and needed for the two of them! For their session, they definitely wanted to include a coffee shop and Presta was perfect! 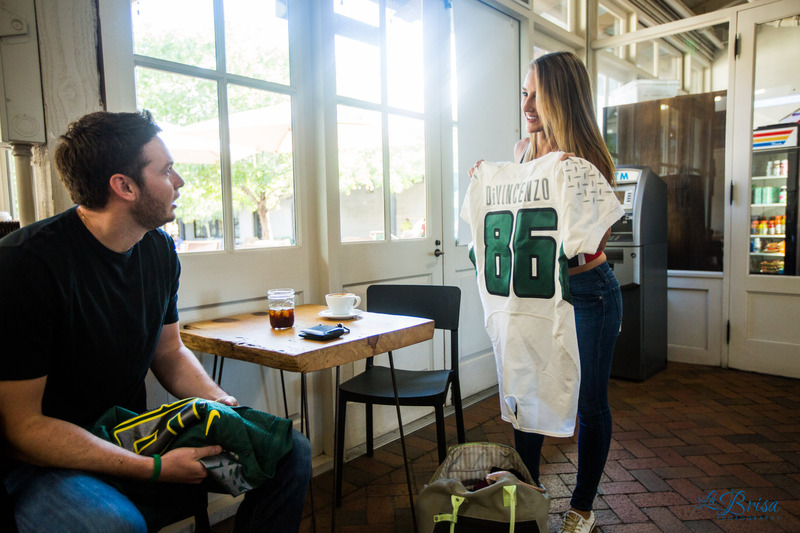 One of my favorite parts of the shoot was when Sam surprised Chris with his game jersey from the Rose Bowl that she purchased from ebay and hid from him for the past 6 months! Chris had the best shocked reaction! Sam and Chris are hilarious together. They are goofy, self-deprecating, sarcastic and joyful. Both are easy to laugh with and at each other. I love how much Chris seeks to protect Sam. There’s an explicit chivalrous quality to how he engages her. Sam possess an unmistakable energy filled with wittiness and happiness. I love how Sam evokes Chris’ true nature. Together, they were one of the best relationships I’ve ever photographed! A huge thanks to Kelly Felix for assisting and shooting with me! You’re the best!!! Thank you for trusting me with preserving your relationship and congratulations again on your engagement!!! PHOTOGRAPHY FOR A CAUSE UPDATE!!! Tuesday, September 5th, is the last day to purchase my fine art and travel photographs via Photography For a Cause! I am donating 100% of profits to the Hurricane Harvey Relief Fund. We’ve only raised $385.03 towards my $1,000 goal! Go to www.photographyforacause.com to purchase this image from Alaska and to view all of the available photographs for sale!